I. Shifting Focus On Infant Baptism "Mystery"
Last year we highlighted an unusual trend in Catholic Church sacramental data showing that the number of infant baptisms, as a percentage of all live births in the United States, had fallen below levels of survey-based self-identified affiliation. This presumably means that some Catholics are having babies but not choosing to baptize them in the Church as infants. Yet many of these parents are still self-identifying as Catholic. At the time we posited several potential hypotheses. Now we have more data to do further analyses on this topic. Looking state by state and over time at the number of Catholic baptisms (The Official Catholic Directory or OCD), total births (CDC), Catholics (several sources from the OCD to ASARB to multiple survey-based measures of self-identification), and total population (Census) we can see that the Church's current "deficit" in infant baptisms is primarily concentrated in handful of states and first among these is Texas. Perhaps these deficit states are simply over-estimating the size of their Catholic populations? This could lead to the appearance of a deficit because the Catholic affiliation percentages are "inflated." For example, religion researchers at ASARB estimate a significantly smaller Catholic population in Texas than any other widely used source. At the same time ASARB doesn't really measure population and instead estimates numbers of religious "adherents" which are “equivalent to those who are known in some way to each parish or mission.” This falls quite short of what we need and is inconsistent with results from every other method of Catholic population examined (...you can be Catholic regardless of your local parish knowing your name and address!). ASARB is a better reflection of the Catholic population that is registered with a Catholic parish. The problem with this is that fewer and fewer Catholics—especially immigrants and younger people—are registering with a parish. CARA's most recent national surveys estimate that only 55% of adult self-identified Catholics and 79% of adults surveyed in-pew at Mass are registered with a parish. At the same time one presumably needs to be registered with a parish to baptize their children! Why might a self-identified, semi-regular Mass-attending Catholic not register with a parish and/or baptize their newborns? Non-citizens may be wary of providing the information needed to register. A growing number of births in the U.S. are outside of marriage (18% of births in 1980 compared to 41% in 2011) and some parents may be wary of approaching a parish priest for baptism without being married in the Church. We also know that poverty can lead to delaying of all kinds of life decisions including marriage and other sacramental celebrations. We looked to test these hypotheses with state-level numbers in CARA's databases. We used regression analysis to simultaneously weigh the importance of these factors as well as a set of control measures (e.g., availability of resident priest pastors, numbers of Catholics per parish). 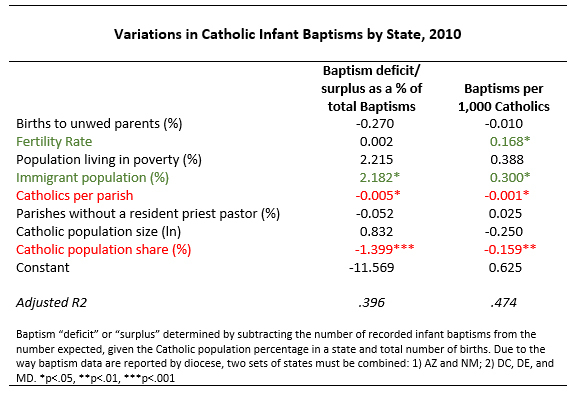 We look at two outcome variables: 1) the baptism deficit/surplus in the state as a percentage of total baptisms (i.e., the difference between baptisms and those expected given affiliation) and 2) the crude baptism rate, which is baptisms per 1,000 Catholics in a state. The table below shows regression coefficients. Statistically significant and positive factors, those consistent with more baptisms, are shown in green. Those that are significant but negative are shown in red (...all other coefficients are indistinguishable from 0). As one might expect, states with higher fertility rates have more infant baptisms, controlling for all other factors in the model (...the effect of each statistically significant variable is additive). For example, we would expect a high-fertility state like South Dakota to have a crude baptism rate that is 4.3 celebrations per 1,000 Catholics higher than a low-fertility state like Rhode Island just because of the higher birthrate. Fertility is not related to any surplus or deficit in baptisms relative to affiliation. Contrary to our hypothesis, the higher the foreign-born share of a state's population, the higher the crude baptism rate and the greater likelihood of a surplus of baptisms relative to the size of the Catholic population. Many immigrants to the U.S. are of child-bearing age and often bring with them higher fertility rates of their home countries. For example, we would expect a state with a high immigrant population percentage like California to have a crude baptism rate that is 7.8 celebrations per 1,000 Catholics higher than a state with a small immigrant population percentage like West Virginia. The results also indicate that higher immigrant population percentage states are more likely to have "surplus" baptisms well above what we would expect given the Catholic affiliation percentage of the state. California is the prime example where the OCD indicates that 30.6% of the population self-identifies as Catholic and infant baptisms in the Church for this state in a given year represent 35.9% of live births there. No other factor is positively related with the two outcomes examined. There are also no statistically significant effects related to the percentage of births to unwed parents or the poverty level of a state. However, there are two factors with statistically significant and negative relationships with baptism outcomes. The first is the number of Catholics per parish in a state and the second is the state Catholic population percentage. Together, both may represent the effects of "super-sizing" the American parish through mergers and new construction focused on "mega-parishes." Essentially, the baptism deficits are most likely to occur in states with large Catholic populations and few parishes, controlling for all other factors. A state with 8,000 Catholics per parish would be expected to have 7 fewer baptisms per 1,000 Catholics than a state with 1,000 Catholics per parish, controlling for all other factors. A state where 35% of the population is Catholic would be expected to have 4.8 fewer baptisms per 1,000 Catholics than states where 5% of the population is Catholic, again controlling for all other factors. States with higher Catholic population percentages and/or Catholics per parish are significantly more likely than other states to have a "baptism deficit." What does this all mean? These results reveal a possible institutional shortfall in the U.S. Catholic Church in areas where the Catholic population has grown strongly and quickly in recent years (i.e., South and Southwest, and the suburbs). Essentially it shifts our focus to a new set of hypotheses: Are some Catholics simply being crowded out? Is there a "limit" to the size of a vibrant Catholic parish? Do Catholics in some states feel like they are on a "waiting list" for baptism or other sacraments? Do large parishes inhibit registrations? Is a large regional parish less effective in building and maintaining the faith than multiple smaller neighborhood parishes? CARA has noted some strange results related to parish size in the past. 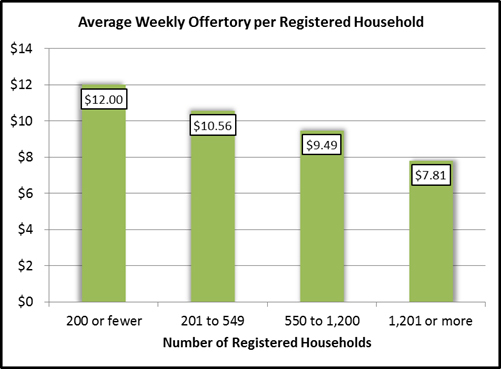 For example, the figure below, from research for the Emerging Models of Pastoral Leadership, shows the average amount a household gives to weekly offertory by the size of the parish. As the size of the parish increases, the amount given per household falls. This is an effect that other CARA studies at the diocesan level for the International Catholic Stewardship Council (ICSC) have confirmed. In his farewell address as president of the USCCB, Cardinal Dolan asked the audience, "This morning I want to invite us to broaden our horizons, to 'think Catholic' about our brothers and sisters in the faith now suffering simply because they sign themselves with the cross, bow their heads at the Holy Name of Jesus, and happily profess the Apostles' Creed." He would go on to cite troubling data from Pew regarding religious freedom around the world. 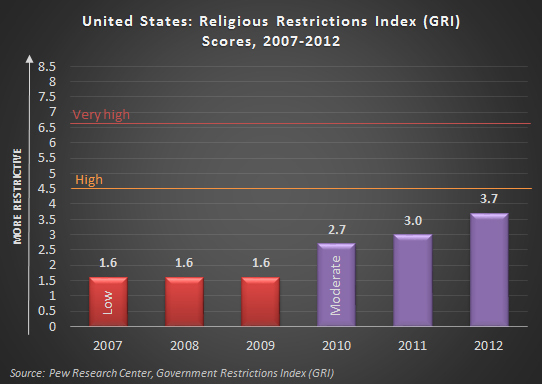 Last week, Pew released its report for 2012 on government restrictions on religion. Pairing this with another recent Pew study on the size and distribution of the global Christian population we can estimate approximately just how many Catholics live in states where "government laws, policies and actions” strongly “restrict religious beliefs and practices" (2014, p. 9). 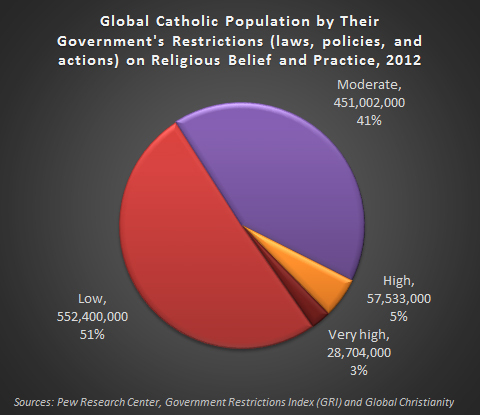 As shown in the figure below, about 8% of the world’s Catholics, or 86.2 million people, live in countries where there are "high" or "very high" government restrictions on religion. A majority, 51% live in states with "low" government restrictions and another 41% live in states with "moderate" restrictions. Two-thirds of the world’s Catholics (67%) live in just 15 countries. One of these is of course the United States (6.8% of the world’s Catholics). The USCCB has also been vocal about government "laws, policies and actions" that they consider to be restrictive of religious practice here at home and Pew's new scores indicate that there indeed may be growing issues with the free exercise of religion here. 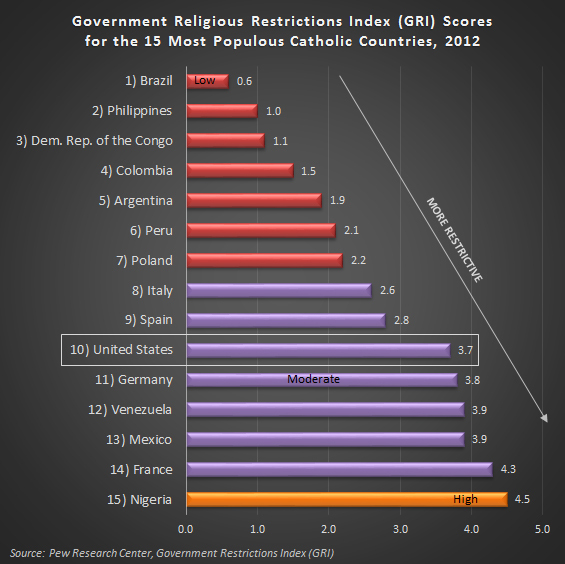 As shown in the figure below, aspects of government in the United States are considered more restrictive of religion than in nine other countries with large Catholic populations. In fact, there are an astonishing 130 countries in all where government is generally considered less restrictive of religious practice than in the United States, according to Pew’s scoring. There are only 67 countries considered more restrictive (the worst of these being Egypt, Saudi Arabia, Iran, China, and Indonesia). Why the relatively poor report card? The United States' grades initially took a hit in 2010 moving from the set of countries with "low" restrictions in the "moderate" field. Things are getting worse by the year and if current trends continue the U.S. could be on track to reach the "high" restrictions group soon. What is going on? You need to dig back into the Pew archives a few years for an explanation for the initial category switch in 2010. Pew states, "During the period from mid-2009 to mid-2010, a number of the sources used in the study reported an increase in the number of incidents at the state and local level in which members of some religious groups faced restrictions on their ability to practice their faith" (2012, p. 15). These violations included restrictions on appearance related to religious practice for prisoners as well as the restricting of religious conversions in prison, difficulties in obtaining permits for religious building construction, and states proposing bans on sharia law. Many of the incidents cited by Pew are related to restrictions on Americans who self-identify as Muslim, Jewish, Buddhist, Hindu, or Sikh. One incident involving difficulty obtaining building permits for a Christian group. All of the restrictions are apparently related to state and local-level issues. No mention of the federal government is made (...although this should not be too surprising as the source documents citing abuses in the United States are from the U.S. Justice Department and the FBI, which would be unlikely to recognize and/or indicate abuses of the federal government—a potential methodological blind spot). In his farewell address Cardinal Dolan said, "Protecting religious freedom will be a central social and political concern of our time." The Pew data indicate he may have been on to something with that statement despite the lack of media attention to the issue. The increases in restrictions in the U.S. mirror broader increases elsewhere. In 2007, 57% of countries around the world had some level of government interference with worship and religious practice. 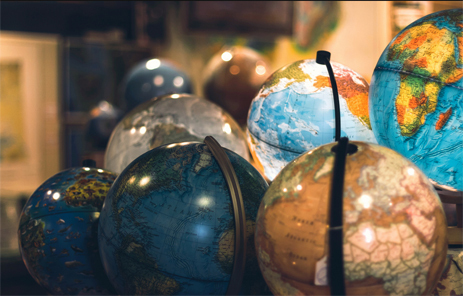 Pew estimates 74% of countries did so in 2012. Pope Francis, the first pope born in the Americas, has named his first new cardinals and in doing so has potentially made a bit of global history. As of Feb. 22, when the new cardinals are scheduled to be elevated, Europeans will not make up a majority of cardinal electors (i.e., those eligible to select the next pope and the pool from which popes are typically selected). Since 1978, Europe has been at or near 50.0% of cardinal electors at the time of a conclave, however assuming Cardinal O'Brien from Scotland would not participate as an elector in the future as he has retired and undergoing a course of "spiritual renewal, prayer, and penance," the European share will functionally fall to 49.6%. According to Vatican's most recent estimates in the Annuarium Statisticum Ecclesiae, Europeans represent 23.5% of the Catholic population. By comparison, Catholics in the Americas represent nearly half of the world's Catholic population. 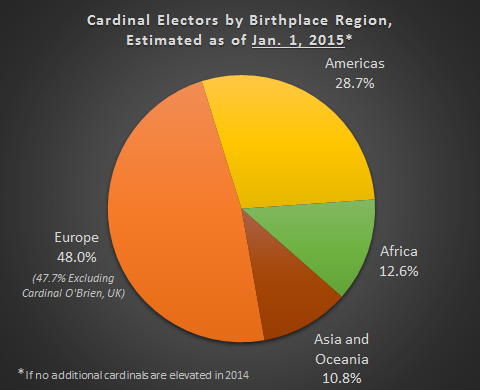 As of February, only 27% of cardinal electors will have been born in the Americas (note that Cardinal-elect Ricardo Ezzati Andrello, S.D.B., the Archbishop of Santiago de Chile, was born in Italy). One current cardinal elector will turn 80 before February. Ten others will do so by the end of 2014. 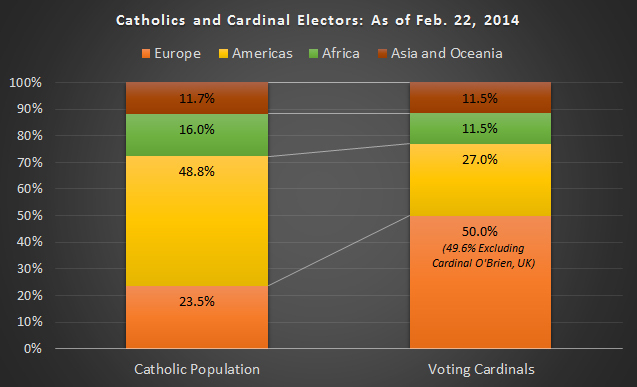 If no new cardinal electors are elevated, the European share of the College's voters will fall to 48% in 2015. In 2012 there were two consistories, however this has been rare historically. The last time this happened prior to 2012 was in 1929. Globes image courtesy of Ivan McClellan.